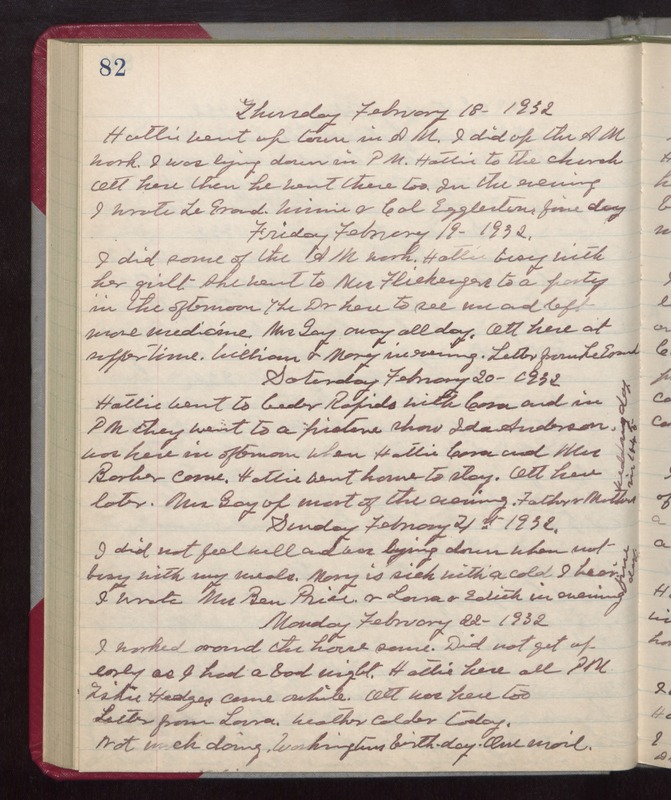 Thursday February 18- 1932 Hattie went up town in AM. I did up the AM work. I was lying down in PM. Hattie to the church Ott here then he went there too. In the evening I wrote LeGrand, Winnie & Cal Eggleston. fine day Friday February 19- 1932. I did some of the AM work. Hattie busy with her quilt She went to Mrs Flickergers to a party in the afternoon The Dr here to see me and left more medicine. Mrs Gay away all day. Ott here at supper time. William & Mary in evening. Letter from LeGrand Saturday February 20- 1932. Hattie went to Cedar Rapids with Cora and in PM they went to a picture show Ida Anderson was here in afternoon when Hattie Cora & Mrs Barber came. Hattie went home to stay. Ott here later. Mrs Gay up most of the evening. Father & Mothers wedding day in 1845 Sunday February 21st 1932. I did not feel well and was lying down when not busy with my meals. Mary is sick with a cold I hear. I wrote Mrs Ben Price, & Laura & Edith in evening. fine day. Monday February 22- 1932 I worked around the house some. Did not get up early as I had a bad night. Hattie here all PM Tishie Hedges came awhile. Ott was here too Letter from Laura. Weather colder today. Not much doing. Washingtons birth-day. One mail.